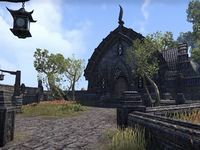 Volunidai's Manor is an estate located in far eastern Deshaan, east of Silent Mire. The exterior is named Manor Garden, while a trapdoor outside the walls leads to the Manor Kitchen. A rowboat will take you here from Tal'Deic Grounds Wayshrine during the related quest. The One That Got Away: Help Zeira with a personal matter. The interior of the manor is considered a restricted area, but no one within will report you for trespassing. This estate was added to the game in Update 1, at which point it was unnamed and could not be entered. Datamining suggests that its original name was Sysa's Estate. This page was last modified on 19 November 2018, at 06:52.